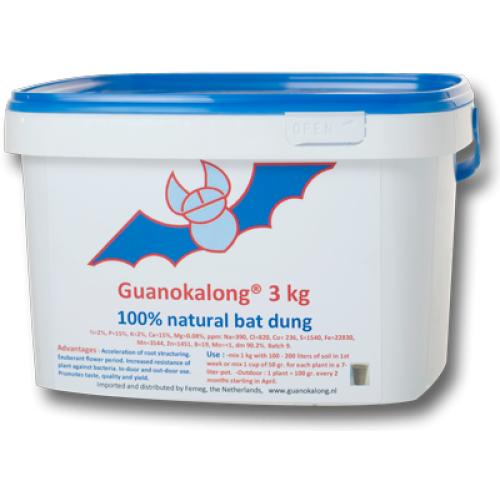 GuanoKalong Bat Guano is a 100% natural bat dung for unprecedented results. Centuries ago Incas discovered the powerful natural source Bat Guano, the perfect flowering fertiliser for growing plants and crops. The organic super fertiliser Guano Kalong is promoting taste, quality and yield. Adds a lot of P and also N, K, S, Ca/Mg, micro-elements and enzymes. Acceleration of root structuring (ideal for cuttings). You will love the taste of your natural grown products. Increased resistance of the plant against diseases and fungi. Indoor and outdoor use, efficient, practical and odourless.